An old favorite from our childhood! 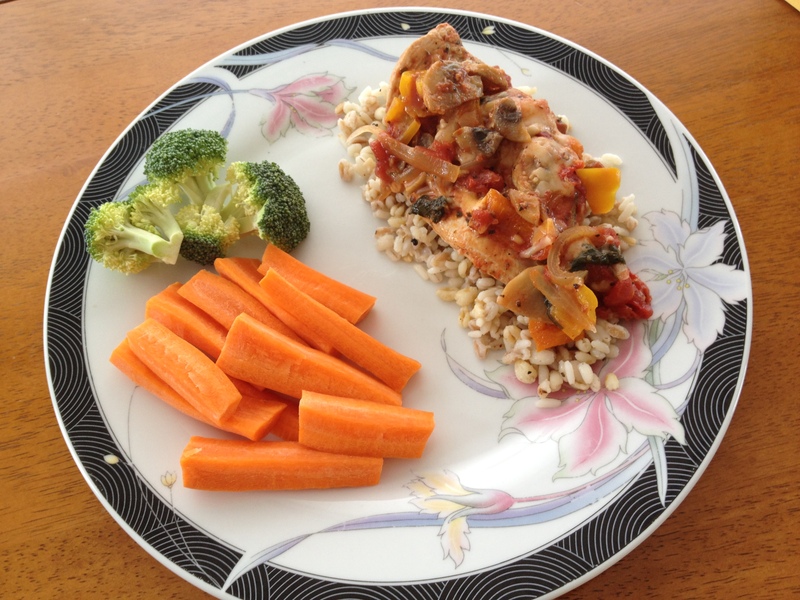 Chicken with lots of great vegetables make this dish a good, hearty meal that is light but filling. Preheat oven at 375 degrees F and prepare a 9 x 13 baking pan. Slice chicken breasts in half lengthwise to make smaller pieces or pound chicken breasts between 2 pieces of parchment paper until about 3/4 inch thick. Brown chicken in 1/2 tablespoon grapeseed oil for 3 or 4 minutes. Place chicken in prepared baking pan. In same skillet where chicken was browned, saute in remaining grapeseed oil the onions, mushrooms, peppers, spinach, Italian seasoning and salt for about 6 minutes. Add canned or fresh tomatoes to skillet with vegetables. Add tomato paste and stir mixture. Cook for another 6 minutes. Pour tomato and vegetable mixture on top of chicken evenly spreading over chicken. Sprinkle with Parmesan cheese if using. Bake chicken for about 30 minutes or until temperature reaches 165 degrees F.
Sprinkle an additional tablespoon of Parmesan cheese if desired. Serve over steamed rice, grains, quinoa or bok choy. Note: Use canned Italian stewed tomatoes to add additional flavor. However, be sure to buy a low sodium brand or eliminate the salt in the recipe.